World Boxing Association (WBA) No. 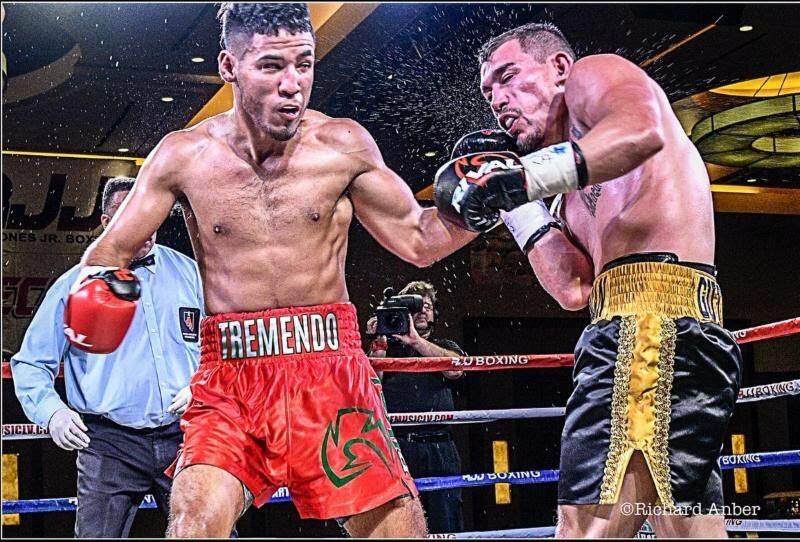 14-rated junior welterweight prospect, undefeated Kendo “Tremendo” Castaneda will be at home Thursday, March 28, intending to make a strong impression for his future, against dangerous Dominican Eudy “AK47” Bernado in the 10-round main event at Cowboy Dance Hall in San Antonio, Texas. Castaneda vs. Bernardo, co-promoted by Roy Jones Jr. (RJJ) Boxing Promotions and Leija Battah Promotions, will headline a card to be streamed live on UFC FIGHT PASS, starting at 9 p.m. ET / 6 p.m. PT. The show is the fourth under a new agreement between Castaneda’s promoter, RJJ Boxing, and FIGHT PASS, to live stream up to 72 professional boxing events over the next three years. The 25-year-old Castaneda (15-0, 7 KOs) started boxing at the age of 10, never trying any other sports after falling in love immediately with the “Sweet Science”, although he does have boxing blood flowing through his veins. His maternal grandfather was a boxer and his uncle fought and sparred local legend Jesse James Lejia. Castaneda had approximately 120 amateur fights, highlighted by his gold-medal winning performance at the 2018 Ringside World Championships. He was also a two-time San Antonio and Texas State Golden Gloves champion (201102012), losing both times at the Golden Gloves National Championships both years to the eventual champion. At 18, Castaneda decided that he’d have enough of amateur boxer and he turned pro, never looking back at that decision, because he feels his style is much better suited for the pro ranks. Now, he’s preparing to fight in front of his passionate San Antonio fans, after a rough journey as a pro, at least until he signed a pro contract with RJJ Boxing. “I made it to 11-0 as a pro without a promoter or manager,” the well-spoken, personable Mexican-American boxer explained. “I had a few chances to sign a promotional contract, but I fought on one-fight contracts until I signed with Roy Jones Boxing. I fought some good fighters in their backyards and took them out. Everybody in in this city knows I’m ready for a big fight. Castaneda is thrilled to have signed with Roy Jones Jr. Boxing, not only because of the added exposure and support he’s receiving, but something much more personal. Castaneda is coming off his most impressive performance this past December in San Antonio, winning a dominant 10-round unanimous decision (100-90, 99-91, 98-92) over previously undefeated Gilbert Venegas, Jr. (10-0) to capture the vacant North American Boxing Association (NABA) super lightweight title. Bernardo (24-3, 18 KOs), a former Dominican Republic lightweight champion, is a lethal puncher, knocking out 18 of his of the 24 opponents he had defeated during his is 9 ½-year professional career. The co-featured event finds unbeaten Baltimore lightweight Xavier Wilson (10-0-1, 1 KO) against once-defeated, heavy-handed John Arellano (9-1, 9 KOs), from Austin, Texas, in an eight-round bout. Houston’s undefeated welterweight prospect Jerrico “Hands of Stone” Walton (11-0, 7 KOs) versus an opponent to be determined in the FIGHT PASS opener. Also fighting on the undercard in a pair six-rounders are intra-state rivalry bouts between unbeaten San Antonio lightweight Joseph “Mongoose” Rodriguez (14-0-1, 2 KOs) vs. Darryl Hayes (6-12, 1 KO), of Houston, and Austin, TX knockout specialist Alexis Camacho (21-6, 19 KOs) vs. Houston junior middleweight Rich “The Ruler” Graham (6-21-4). San Antonio welterweight Daniel Baiz (13-1, 5 KOs) vs. TBA in a six-round fight, plus two four-rounders: San Antonio’s pro-debuting Raymond Guajardo vs. Brownsville, TX middleweight Askary Ibarra (0-4), and San Antonio junior featherweight Henry “World Star” Arredondo (2-0) vs. Mexico’s Jahaziel Vazquez (2-9, 1 KO). Tickets are priced at $109.00 (ringside), $76.00 (floor), $70.00 (VIP/balcony table), $38.00 (stools) and $22.00 (general admission) and available to purchase online at https://lbtickets.ticketleap.com/castaneda-vs-bernardo/. Doors open at 6 p.m. CT, first bout at 6:30 p.m. CT.